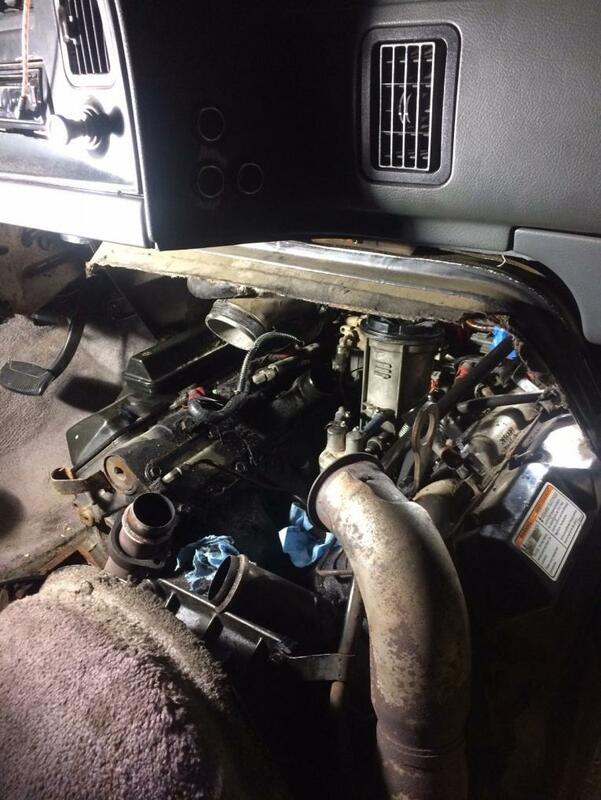 No surprise to anyone who's been around the 7.3 Diesel platform, after 195k miles on my van, it's time to chase down the leaks that congregate between the heads, in the 'valley' of the 7.3 Diesel V8. I've had drips that exit underneath between the engine and transmission for some time, but it's gotten worse. There is a weep hole that goes from the valley, exiting on the passenger side of the block between the engine and trans. That dripping is often mistaken as a rear maim seal, because the drips come out the bottom the the torque converter cover. More recently, I've been smelling Diesel fuel, which gets stronger when you run it with the engine cover off. After doing some internet research, armed with the knowledge of the typical leak paths and culprits, I tore into it. It's tight, removing the turbo seemed the best thing to do to get access. Besides, I'm going to change out the pedestal o-rings while I'm in there. one thing you might check for is the hard fuel line along the passenger side valley (if your vintage 7.3 has it). mine had been rubbing on something and was almost all the way through. I developed a fuel leak within a day of getting our van from Georgia. came out the next morning after getting home and there was a huge puddle of diesel. ended up being the water release valve on the fuel bowl. The turbocharger on my 1995 is mounted like a Chinese finger puzzle... the up pipes also have to be loosened. Mine weren't bad, accessible on the van, but I wouldn't want to remove the turbo on a '95 truck. I’m noting everything that looks suspect along the way, making a list, researching commonly changed parts on the early Powerstroke 7.3. The exterior of fuel bowl is dry, which is amazing considering it's got to have 8 or more possible leak paths. I'm ordering new viton o-rings to replace them, as a precaution. Unlike the later 7.3’s that use an electric fuel pump mounted on the frame rail, from 1994.5-1997 IH/Ford used a mechanical fuel pump that they call ‘the Lift Pump’. It resides in the valley, has three fuel hoses, inlet, return, high pressure output, high pressure return. My valley is full of oil, captured in the cast in block ‘dikes’ that overflow, and exit the block weep hole, then out the bottom. I'm not certain what is leaking, but it's not the high pressure oil pump or lines near the front of the valley, all of that is dry. I also think fuel floating on top of that oil. There's also a small amount of fuel dribbling down the driver’s side rear head, from the high pressure fuel supply line. Those rubber seals are known to go bad with time. The pump looks like a replacement, but the crush washers at the huge banjo fitting at the rear of the lift pump, look old, as if someone reused them at pump swap out. It's got worm drive hose clamps in use too, which I don’t like because the smaller hose clamps never make a nice ‘circle’ more of a D shape, so you have to get them extra tight to prevent leaks. The hose gets deformed, and that's where the hose usually fails with time. I have a new Carter lift pump, crush washers, high pressure return line seals, blue fuel hoses, and fuel injection style hose clamps that seal better on smaller diameter hose, all on their way. The only thing I can think of is, the damage happened after the Ford intake tract resonator popped off of the intake hose, leaving a 1" gap, bypassing the air filter, when in Death Valley last year. The bracket broke and likely popped off when I buried the van in 18" of dry lakebed silt, had to really push it, kicking up a ton of fine dust getting unstuck, then keeping it moving over the rutted trail a little too fast, trying not to get stuck a second time. 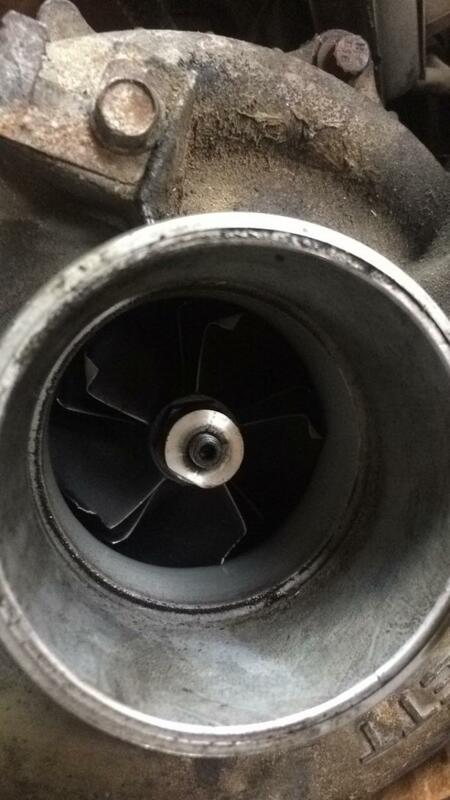 A longtime Ford technician friend of mine, after seeing pics, says "we call that turbo 'dusted' ". Cloud of silt, acting as 'high viscosity air', going thru a 30,000 rpm spinning impeller, will do that I guess. I wondered why the air filter wasn't dirtier after that incident, I only discovering the rattling disconnected resonator and broken bracket a month ago, during some maintenance. Yep, on order, good call Herb! That's the regulator. Do those things wear out? ...ended up being the water release valve on the fuel bowl. I noticed the front of my block is damp, and has a lot of road grime build up, at the fuel bowl drain tube exit. Seems to be common from what I've been reading. o-rings for the drain valve in the fuel bowl seal kit, on order, good call! ...That's the regulator. Do those things wear out? No idea. Just like you I figured I'm in there anyway, so do it once. Mine took me about 5-6 hours with my (limited) mechanical skills, and that was on an Excursion. Not sure if it's easier or worse access on a van. BTW, make sure you don't order the parts directly off what I linked, those are for '99-'03 motors. Not sure if there's a difference. Been there, done all that on my 96, sounds familiar. I did all this a little over a year ago and for some reason decided to go all the way, replaced the HPOP with a terminator pump, new lift pump, new IPR, New HP oil lines, rebuilt fuel bowl, new hoses and clamps, oil crossover (I recommend that while your at it for about $60), monster glow plug relay, and for some reason decided to do new injectors and glow plugs while I had it apart since I had 220k, etc, etc. Turned out replacing just about everything I could think of but all those little things do add up quickly! I try to convince myself it was for peace of mind, lol. Good luck, I could eat off my valley once it was all cleaned up.